Enjoying the beautiful outdoors doesn't have to end when the chill of autumn arrives. Blanket your PATIO in a circle of warmth and bring your friends and family outside much later into the fall and earlier in the spring. pureHeat PATIO brings the comfort of the indoors outside with a 15-foot area of consistent heat that is unaffected by the wind. With a quick and simple setup, you are minutes away from enjoying your morning coffee from the comfort of your warm PATIO, allowing you to experience the seasonal changes in nature rather than through your windows. pureHeat PATIO can be used in any outdoor space, garage, shop, cabin, or wherever you want effective, comfortable heat. 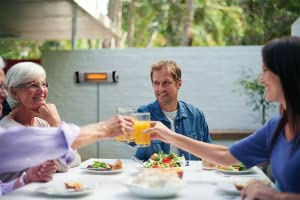 Find out how the new revolution in heating is bringing the family outdoors again! pureHeat PATIO's ruggedness makes it a perfect fit for outdoor use. The aluminum body and design allow it to withstand the constant torture that mother nature throws at it. While it may not be ideal for monsoon weather, it certainly works in anything you yourself would want to stay out in. Don't worry about walking away and leaving your heater on. With pureHeat PATIO's 24 Hour Shut-Off Timer, you'll be able to set the desired shut-off time and know it will take care of itself. Using three different heating modes, pureHeat PATIO's Carbon Fiber Element provides safe and efficient warmth without any of the dangers of Oil, Ceramic, or Quartz Bulb heaters. 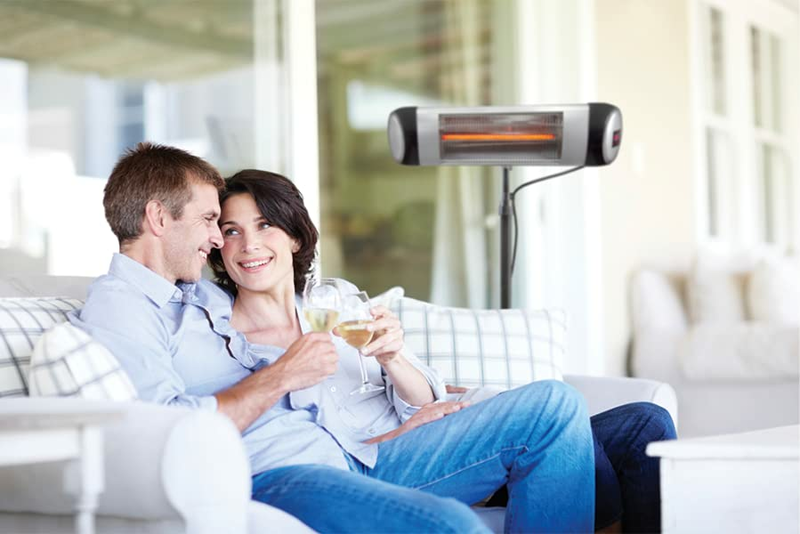 With an estimated lifetime of 5,000 hours, this heating element will keep you warm for years to come! Tired of getting up to adjust the temperature or fan speed on your current heater? pureHeat PATIO comes with a remote to control Power Modes along with the 24 Hour Shut-Off Timer so you can make adjustments from the comfort of your seat. 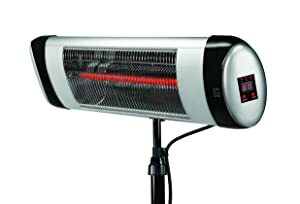 Your safety doesn't stop at the Carbon Fiber Infrared Heating Element. pureHeat PATIO has far-reaching legs to prevent tip-overs, but because accidents happen, it also has a built-in Tip-Over Safety Shut-Off feature that will turn the power off if your heater ever gets knocked over. Need to save a little extra floor space? 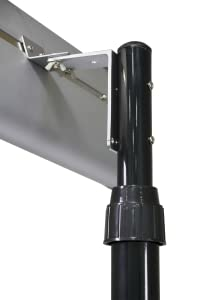 Use the included mounting bracket to remove pureHeat PATIO from your walking or sitting space. The unit connects easily to the mount and remains sturdy until it is removed. Enjoy more time working in your garage or relaxing on your patio later in the fall and earlier in the spring with pureHeat GARAGE & PATIO. 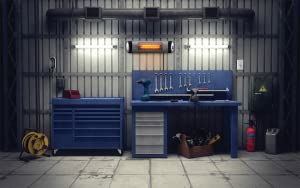 pureHeat GARAGE & PATIO extends the outdoor season by providing consistent, safe heat felt up to 15 feet away in your garage, patio, porch, workspace, or yard. Designed to withstand wind and rain, pureHeat GARAGE & PATIO includes 3 adjustable settings, multiple mounting options, and an auto shut-off timer for simple, effective warmth. pureHeat PATIO’s ruggedness makes it a perfect fit for outdoor use. The aluminum body and design allow it to withstand the constant torture that mother nature throws at it. While it may not be ideal for monsoon weather, it certainly works in anything you would stay out in. Using 3 different heating modes, pureHeat PATIO’s carbon fiber Element provides safe and efficient warmth without any dangers of Oil, Ceramic, and Quartz Bulb heaters. With an estimated lifetime of 5,000 hours, this heating element will keep you warm for years to come. 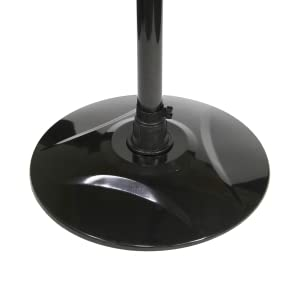 Your safety doesn’t stop at the Carbon Fiber Infrared Heating Element! pureHeat PATIO has far-reaching legs to prevent tip-overs but, because accidents happen, it also has a built-in Tip-Over Safety Shut-Off feature that will turn the power off if your heater ever gets knocked over. Don’t worry about walking away and leaving your heater on. With pureHeat PATIO’s Shut-Off Timer, you’ll be able to set the desired shut-off time and know it will take care of itself. Tired of getting up to adjust the temperature or fan speed on your current heater? pureHeat PATIO comes with a remote to control Power Modes and the 24 Hour Shut-Off Timer so you can make any adjustments from the comfort of your warm seat. Need to save a little extra floor space? Use the included Wall and Ceiling Mounts to remove pureHeat PATIO from your walking or sitting space. The unit connects easily to the mount and remains sturdy until it’s removed.